Stacey Abrams recalls a term her mother used to describe her family as they struggled through poverty in Mississippi. "My mom likes to call it the genteel poor. We had no money but we watched PBS and we read books," said Abrams. "They really believed that where we started out was not going to dictate where we ended up." 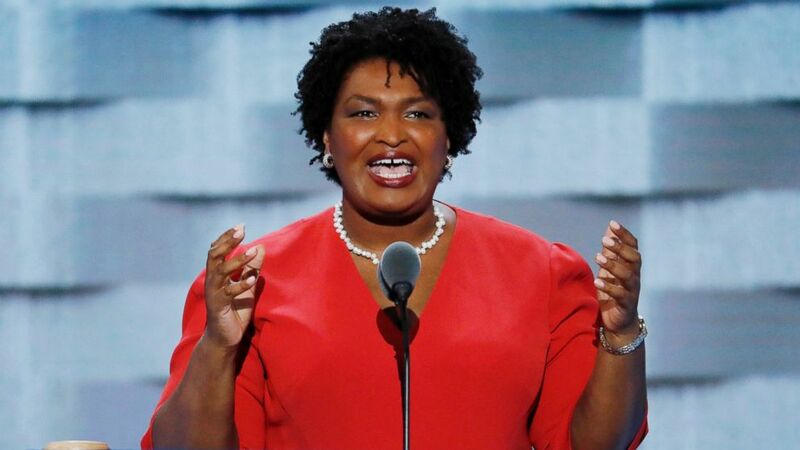 Abrams has today ended up on a precipice of history, with the potential to become America's first female African-American governor if she wins her May Democratic primary and November general election in Georgia. Abrams is looking to replace Republican Gov. Nathan Deal, who has served since 2011, in a state where a Democrat hasn't won statewide office since in over a decade. The governor's mansion would be a far cry from the modest early life led by this daughter of Methodist ministers, who moved their family from Mississippi to Georgia to pursue their religious studies at the age of 40. As one of six children, Abrams said she was raised in a home where family, faith, and service mattered more than anything else. After years working as a tax attorney and, later, deputy city attorney in Atlanta, Abrams said it was those early influences that led her to seek public office in 2006. (AP) Former Georgia House Minority Leader Stacey Abrams, a Democrat, is hoping to become the country’s first black woman governor. "I had only lived in the community for two years, so I couldn’t run on my deep history with the neighborhood. I couldn’t run on previous experience. So I ran as a technocrat," said Abrams. "So I would do these Jeopardy-style games during my campaign where I'd have people ask me just random questions about government. And so I think they elected me just because it was, I was an oddity. But I also worked really hard. I was very relentless because government is good if it’s done well and it helps people." Her first campaign, said Abrams, represented a huge learning curve for her -- not just as a first-time candidate, but as a woman in a male-dominated field. "You don’t have role models who show you how to do it,” recalled Abrams. “And there’s an internal dynamic that I’ve seen among women that doesn’t seem to exist among men, where we believe we have to be experts before we stand for office. Men wake up, some of them, and look in the mirror and think, ‘I’m attractive, I should be in charge of something.'" Abrams went on to rise through the political ranks, eventually becoming minority leader in the Georgia House of Representatives and launching an effort along the way called the New Georgia Project, with a goal of registering tens of thousands of new voters that Abrams said could make all the difference for Democrats in a state with 6 million voters. "In 2014, there were 800,000 unregistered people of color. That's roughly the population of South Dakota. And that means that you had nearly a million people whose children were in our school systems who weren't voting, who were being affected by choices made at the city council state legislative levels, at the gubernatorial levels," said Abrams. "Most people, when they think about Georgia, you know, we're 70/30 white to black or maybe 60/40. Georgia today is 53 percent white, non-Hispanic, 47 percent people of color. We’re near parity in our composition, but not in our voting. "For me, the issue was larger than that. It was the issue of having nearly a million people who simply had not become part of the body politic," she continued. "That’s dangerous for democracy, no matter which side of the aisle you stand on." On Abrams' own side of the aisle, she faces a primary opponent in the form of a state representative who also happens to be a lawyer, who also happens to be a woman, and who also happens to be named Stacey. Her opponent also overcame a difficult childhood to achieve great academic and professional success. Stacey Evans, however, is white. "I don’t want anyone to elect me because I'm black," said Abrams. "I don’t want anyone to elect me because I'm a woman. But I want them to know that as a black person and a woman who’s positioned for this job with my resume and my experience, that those are two markers that tell them that I will be good at this. Because I've navigated so much to be in this spot." "I think the opportunity is for us not to say, 'Am I viable because I'm a Black woman?' The opportunity is to say, 'how can we lose, when we have someone who brings together so many of those things we want for our state,'" she said. Download and subscribe to the "Uncomfortable" podcast on Apple Podcasts, Google Play Music, Stitcher and ABC News podcasts. Abrams was interviewed as part of a series called "Uncomfortable," hosted by Amna Nawaz, that offers in-depth honest conversations with influential figures about issues dividing America.